Putting your best foot forward is no problem with our cotton Striped Gartering - in combination with one of our brass garter or harness buckles. It is easy to slip the tongue of a buckle through the garter material to secure it at any point comfortable to you, and thus check those slouchy stockings, which is quite important, for we all know there is a fine line between holding up hose and cutting off one's circulation below the knees. 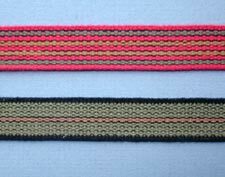 Green/Tan/Black is heather green with black edges and a narrow tan center stripe outlined in black. Red/Green/Gold alternates in a pattern of red, green, red, gold, red, gold, red, green, red stripes, each one thinly outlined in black - very handsome indeed! Durability through wind, rain and repeated tying when attached to a canvas tent is the hallmark of #10 Standard weight cotton web, which is a little lighter than our Medium Weight Webbing. Further to its credit, it does double duty as a pocket for holding metal stays in period garments without their breaking through.